A new look could be all it takes to help you fall in love with your brand again. We’d love to help you put your best face forward. Our collaborative design process takes 4-6 weeks and we only take a limited number of bookings per month to ensure we give you our fullest and best attention. Get in touch using the form on our contact page and book a time for a quick introductory chat. If you decide Studio Oudizo is the right fit for you, we’ll send over some documentation for you to sign. Once the deposit is paid, we’ll book you in for your branding consultation. During your consultation (make sure you have a cuppa and some cake nearby), we’ll talk about your business. We’ll delve into your goals and ambitions, discuss what makes you passionate about your business, and build a picture of your ideal client. We’ll find out what your vibe is and what feeling you’d like your clients to get when they interact with your brand. Then you’ll be sent off with a detailed branding questionnaire to complete before we move on to the next phase. We’ll create a collaborative Pinterest board, pulling in images that match the vibe of your new brand direction. Colours, textures, moods, interiors, fashion, cake… anything can be an inspiration source. Pin, pin, pin darling! Our Pinterest board will then be condensed into a mood board. From this we’ll pull colours and textures before moving onto the next stage. We’ll create 3 logo concepts for you to choose from. Pick your favourite and we’ll tweak it until it’s just right. 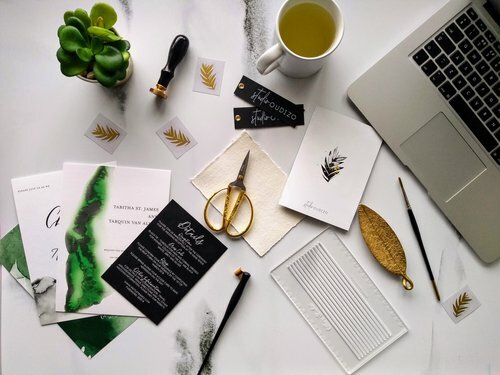 Once your logo design is finalised, we’ll create all the goodies to go with it, including alternate logos and submarks, patterns, typography suggestions and a colour palette. Your final payment is due at this stage. You’ll receive your new logos in vector and picture formats, along with a brand board and branding guidelines to help with the implementation and launch of your new brand. If you book our marketing collateral package, we’ll design your three items at this stage (one round of changes included). You can choose to receive print ready files, or have us manage the print process for you. If you’ve booked our web design package, we’ll have another chat to discuss the design of your new site. You’ll also be given forms to fill to help with the process. Once we’re on the same page (hehe) and we’ve received all your information (copy, photos etc), we’ll craft a few example pages to make sure we’ve got the vibe right. Then with your approval, we’ll create the rest of your site and hand it over to you for launch.